RUPPERT, BRONSON & RUPPERT CO.,L.P.A. Ronald W. Ruppert was elected Judge of the Franklin Municipal Court on November 7, 2017. He began serving as Judge on January 1, 2018. Judge Ruppert was admitted to the practice of law in November of 1988. Judge Ruppert began private practice of law with the firm of Ruppert, Bronson & Ruppert. He represented clients in various matters including civil litigation, domestic relations, juvenile, criminal defense and traffic matters. His practice included matters in municipal, county and common pleas courts of Warren, Butler, Montgomery, Greene and Preble counties. His practice also included matters in the United States District Court for the Southern District of Ohio. Judge Ruppert also served as acting judge in Franklin Municipal Court. Judge Ruppert has been married for thirty-five years and has four adult children and three grandchildren. 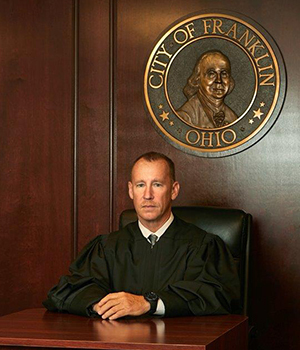 Judge Ruppert graduated from Franklin High School in 1981. Following high school, he attended the University of Cincinnati where he graduated in 1985. Judge Ruppert attended law school at the University of Oregon College of Law from 1985 to 1988. Upon graduation from the University of Oregon College of Law, Judge Ruppert returned to the state of Ohio to begin his legal career. Before being elected Judge, Judge Ruppert served as a Franklin Township Trustee from 2006 through 2017. Judge Ruppert has also served on the Board of Trustees of the Conover Health Center, Inc. and previously served on the Board of Trustees of the Franklin/Springboro Public Library. Judge Ruppert also served on the Joint Emergency Medical Services Board from 2007 to 2016.